Around the world and on both sides of the political aisle, the safety of children is upheld as a universal value. The U.S. has established special protections for children — courts may give special consideration to what is in the best interests of a child in issuing judgments about their well-being. The children of the president and other elected leaders are traditionally “off limits” to reporters. Even celebrities are afforded a degree of privacy from the paparazzi to ensure their children’s safety. With good reason, it is understood that children deserve special status and need to be protected and taken care of — not only by their parents, but by all of us in society. Yet that universal value has been abandoned by the Trump administration, as it recklessly implements policies that separate children from their families, inflicting serious trauma. Since the beginning of the Trump administration, harsh immigration policies and anti-immigrant rhetoric have instilled a deep and growing fear inside many communities, threatening the health, security, and well-being of children in immigrant families. Eighteen million children in the U.S. — 4.5 million children in California alone — are part of an immigrant family, many living in fear as to what may happen if their parent is deported or detained. Millions of Dreamers are stuck in limbo, uncertain of their long-term future. Workplaces are being raided and detained mothers and fathers taken away from their children. Parents who were once protected by temporary protected status (TPS) now must decide whether to leave their U.S.-citizen children behind or take them to countries still reeling from disaster. Most recently, the troubling “zero tolerance” policy, which imposes criminal penalties meant to deter immigrant families from coming to our country seeking asylum, is just another example of this administration’s attack on children. Dr. Colleen Kraft, the president of the American Academy of Pediatrics, referred to the separation of children from their parent as “government-sanctioned child abuse.” Separating children from their parents causes them trauma and toxic stress that can have lifelong negative impacts on their mental and physical health. In the short term, the trauma and stress impair a child’s ability to concentrate, remember things, and control and focus their own thinking. In the long term, they place children at risk of heart disease, diabetes, and cardiovascular disease. From the children directly impacted by the separations to the millions of children in immigrant families across the country, the damage is done. 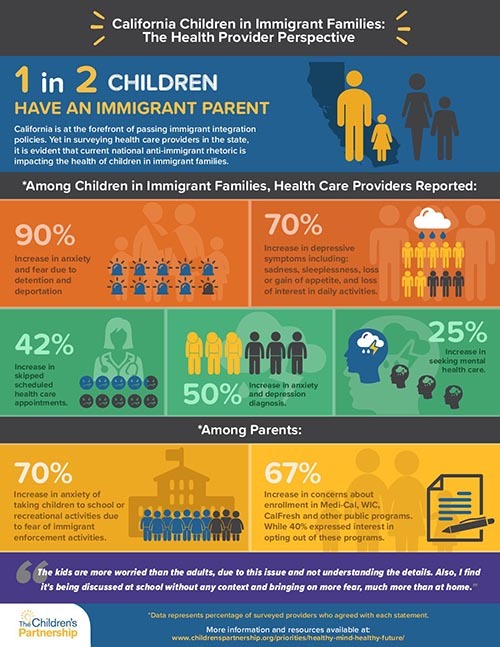 In a survey The Children’s Partnership conducted of health providers in California, 90 percent reported an increase in children experiencing anxiety and fear related to their heightened awareness of the possibility of detention and deportation, because of the current national climate. These negative health impacts due to unjust policies that separate families go against American values of inclusion and equality. Whether it happens at the border, through detention, or deportation later in life, the damage is detrimental. What’s worse? The executive order signed last week by President Trump is not a solution. First, it does nothing to address the trauma experienced by more than 2,000 children already separated from their parents. Second, it seems to say that imprisoning whole families is an acceptable path forward when we know family detention has repeatedly been found to be unsuitable for children. The inhumane conditions that these children face while in detention centers — caged, as well as physically and emotionally neglected — are devoid of compassion and decency. This simply trades one source of childhood trauma for another. The climate of fear, the separation and detention of families, and the uncertainty of the future compels every American to ask, “Where are the children?” in the Trump administration’s priorities. Children in immigrant families are enduring toxic stress, anxiety, and other longstanding negative health impacts due to unjust policies that separate families, traumatize children, and go against American values of protecting children. As an organization that focuses on putting our children’s well-being first in policymaking, The Children’s Partnership denounces the Trump administration’s policies and implores Congress to stop these cruel practices, put our nation’s values into action, and advance policies that defend and protect the dignity and rights of all children.